Jordan Schafer does not have any MLB stats for the season. Draft: 2005, Atlanta Braves, 3rd rd. Played high school baseball at Winter Haven (Fla.) High School... Was a two-way player, hitting .478 as a senior and going 11-0 on the mound with a 0.71 ERA. Struck out 140 batters in 76.0 innings, allowing just 12 walks and 39 hits... Resides in Haines City, Florida. Began the season on the disabled list after undergoing left elbow surgery performed by Dr. George Paletta... Did not pitch in any minor league games, but started four games in the outfield with the GCL Cardinals (R) and Memphis (AAA). Recorded 40 at-bats and batted .350 combined. Made Atlanta's Opening Day roster, his third straight season on an Opening Day roster, fourth of his career and second straight with Braves...Recorded season-high three hits June 6 at Arizona...Stole three bases (4 attempts) July 11 at Chicago-NL, tying his career-high...Hit .163 (13-for-80) with four doubles, two RBI, nine runs scored and 15 stolen bases in 63 games for Braves...Designated for release or assignment August 1 and claimed off waivers by Minnesota August 3...During time with Atlanta, went 15-for-17 in stolen base attempts, posting a 88.2% success rate, tied for fourth in the NL at time of release...Made Twins debut August 5 vs. San Diego, going 1-for-2...Reached base five times August 22 vs. Detroit, with two hits and three walks, tying his single-game career-high, previously done June 16, 2011...Posted career-high 11-game hitting streak August 21-31, hitting .421 (16-for-38) with three doubles, one triple, nine RBI, nine runs scored, five stolen bases and a .500 on-base percentage in that span...Tied career-high with four RBI August 28 at Kansas City...Hit only home run of season September 14 at Chicago-AL, a two-run shot off Hector Noesi...Finished tied for 12th in baseball in stolen bases (30); went 30-for-37 in steal attempts (81.1%) on the season...Hit .285 (37-for-130) with 15 stolen bases and 17 runs scored in 41 games for the Twins. Logged his third consecutive 20 stolen-base season after swiping 22 bags (22 in 2011, 27 in 2012). Made 51 starts in the field: 23 in center field, 20 in right field and eight in left field. As a pinch-hitter, he hit .280 (7-for-25) with one home run and three RBI. Hit his first career pinch-hit home run on 5/6 at CIN as he went back-to-back with Andrelton Simmons. Was placed on the disabled list from 7/4-8/10 with a right ankle contusion. Over his first 59 games of the season, he hit .309 (39-for-123) with 22 runs and a .397 on-base percentage. Went 4-for-5 and matched his career high with three stolen basses on 9/2 vs. NYM before exiting in the 7th inning with a lower back strain. Made his first postseason appearance on 10/7 at LAD as a defensive replacement in right field. Was claimed off waivers by Atlanta on 11/1...Went 27-for-36 in stolen base attempts and did not make an error until his 50th game (6/15). Recorded only two errors all season in 184 total chances for a .989 fielding percentage...Was on the DL from 8/7-31 with left shoulder separation, reinstated from 15-day DL on Sept. 1...Reached base safely in his first 25 games of the season to mark the longest on-base streak of his career. The stretch to begin the season tied the Astros franchise record, set by Denis Menke in 1969...Hit his first career grand slam vs. LAD on April 22. He became the 10th player in Astros franchise history to hit a grand slam while batting leadoff and the first since Craig Biggio on July 24, 2007 vs. LAD at Minute Maid Park...Played in five total minor league games with the GCL Astros (one game) and with Oklahoma City (four games) on a rehab assignment from Aug. 25-31. Hit .200 (3-for-15) during his rehab assignment and stole two bases in five games in the minors before being recalled on Sept. 1. Went 26x106 (.245) in 30 games as an Astro with a home run, six RBI and seven stolen bases...was acquired from ATLon July 31 as part of the Michael Bourn trade...was on the 15-day DL with a left middle finger joint injury when acquired byHouston...missed 19 games from July 27-Aug. 22 and was 10x20 during a five-game minor league rehab assignment...began2011 at Triple A Gwinnett, hitting .256 in 42 games (home run, 21 RBI), before playing in 52 games for the Braves, where he went47x196 (.240) with a homer and seven RBI...had a career-high five hits on June 16 vs. NYM...started a career-high 72 combinedgames at center field for Houston and Atlanta...is a career .288 (17x59) hitter at MMP with one homer and six RBI in 15 games...was 22x26 in stolen base attempts and was successful in each of his last 14 attempts...was 7x7 as an Astro. Placed on the 15-day disabled list on 3/26 while recovering from wrist surgery in 2009. ... Began rehabilitation assignment at Rome on 5/3 where he hit .273 (6-for-22) with two 2B and two SB. ... Rehabilitation assignment was transferred to Mississippi on 5/11 where he hit .294 (5-for-17). ... Rehabilitation assignment was transferred to Gwinnett on 5/15 where he hit .200 (3-for-15). ... Reinstated from 15-day DL on 5/17 and was optioned to Gwinnett on 5/19.Was transferred to Mississippion 7/23. ... Placed on Mississippi's disabled list on 8/2 and was reinstated on 8/9.Was again placed on Mississippi'sdisabled list on 8/19 until the end of the season. ... Hit a combined .201 (55-for-274) with 10 doubles, one triple, one home run, 14 RBI and 12 stolen basesbetween Rome (A), Mississippi (AA) and Gwinnett (AAA). ... Committed just two errors the entire season, while playing the majority of his games in center field. Made his Major League debut in centerfield on 4/5 at Philadelphia and became the first Brave to make his MLB debut as a starter on Opening Day since LF Rufino Linares in 1981 vs. CIN...Became the first player in baseball history to homer in his first Major League plate appearance onOpening Day against the defending World Champions and the 10th Brave to homer in his MLB debut...Entered the season as the Braves' third-best prospect and the organization's Best Athlete, Best Defensive Outfielder and Best Outfield Arm by Baseball America...Was optioned to Gwinnett (AAA) on 6/2, where he appeared in nine games...Had season-ending surgery on his left wrist on 9/5. Spent the season with Mississippi (AA) after serving a 50-game suspension for violating baseball's performance-enhancing drug policy, going on the restricted list from 4/8-5/31...ESPN.com named him the Braves' fourth-best prospect and 67th-best overall in the minors and as the eighth-best center-field prospect in all of the minors...Tied for sixth among Braves farmhands with six triples...Was named the Mississippi Player of the Month for August, hitting .323 (32-for-99) with 6 HR, 20 RBI, 7 2B and 18 R in 29 games...Hit .276 (29-for-105) with one HR and nine RBI in 27 games with Navojoa in the Mexican Winter League. His 176 total base hits was the most hits by any player in all of minor league baseball. His combined totals led all Braves' minor leaguers in runs (86), hits and doubles (49), ranked secondin triples (10) and OPS (.892), third in batting average (.312), tied for sixth in home runs (15) and stolenbases (23) and was ninth in runs batted in (63). Started the season with Rome (A) and hit safely in 26 of 30 games and had 16 multi-hit games and had a.441 on-base percentage. Named Rome's April Player of the Month, hitting .364 with 4 HR, 17 RBI and 12 R. Made his debut with Myrtle Beach on 5/7, going 1-for-5 vs. POT. Started his time with the Pelicans on an eight-game hitting streak, 5/7-14. Finished second on Myrtle Beach with 128 total hits, 10th-best in a single-season for a Pelican. Named as the Braves' top prospect by Baseball America following the season. Named to Baseball America High Class A All-Star team Was a Carolina League Post-Season All-Star. Named Pelicans team MVP, hitting .294 with 10 HR and 43 RBI with 70 R and 19 SB. Was Myrtle Beach's Player of the Month in July, hitting .318 with 3 HR, 11 RBI and 5 SB. His 34 doubles was the fifth most in a single-season by a Pelican. Was third in the Carolina League with eight triples and was fifth with a .294 avg. and 34 doubles. In his final eight games (8/27-9/3), he upped his batting average by 13 points going a combined 16-for-38. Played for Peoria in the Arizona Fall League and hit .324 with 34 hits and 16 RBI. Named to the AFL All-Prospect Team, AFL Rising Stars Team and AFL Player of the Week, ending 10/15. Ranked second in the Braves' system with seventriples and tied for fifth with 60 RBI...ranked the 27th-best Braves prospect by Baseball America and as the Braves' Best DefensiveOutfielder...second on the team in games played, fourth in hits, third in RBI and fourth in slugging...in 112 games in CF hecommitted only two errors. Made his professional debut on June 24 against the GCL Yankees, going 0x3...in July hit .292with 28 hits and 13 RBI...had two four-hit games (July 5 and July 12; both vs. GCL Tigers). June 9, 2018 Sacramento River Cats released LHP Jordan Schafer. May 17, 2018 LHP Jordan Schafer assigned to Sacramento River Cats. April 3, 2018 San Francisco Giants signed free agent LHP Jordan Schafer to a minor league contract. 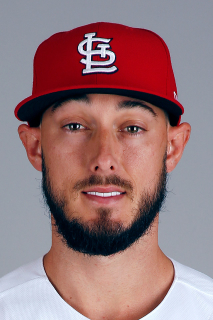 February 7, 2018 St. Louis Cardinals invited non-roster LHP Jordan Schafer to spring training. September 5, 2017 OF Jordan Schafer assigned to Springfield Cardinals from Memphis Redbirds. August 29, 2017 Memphis Redbirds activated OF Jordan Schafer from the 7-day disabled list. August 14, 2017 Memphis Redbirds sent OF Jordan Schafer on a rehab assignment to GCL Cardinals. April 4, 2017 LHP Jordan Schafer assigned to Memphis Redbirds. December 12, 2016 St. Louis Cardinals signed free agent LHP Jordan Schafer to a minor league contract and invited him to spring training. November 7, 2016 OF Jordan Schafer elected free agency. September 2, 2016 OF Jordan Schafer assigned to Oklahoma City Dodgers from Tulsa Drillers. August 15, 2016 Tulsa Drillers sent LHP Jordan Schafer on a rehab assignment to AZL Dodgers. August 10, 2016 Tulsa Drillers sent LHP Jordan Schafer on a rehab assignment to AZL Dodgers. August 10, 2016 Tulsa Drillers placed LHP Jordan Schafer on the 7-day disabled list. Strained left trap muscle. June 15, 2016 LHP Jordan Schafer assigned to Tulsa Drillers from Oklahoma City Dodgers. June 14, 2016 Oklahoma City Dodgers activated LHP Jordan Schafer from the 7-day disabled list. June 7, 2016 Oklahoma City Dodgers placed LHP Jordan Schafer on the 7-day disabled list retroactive to June 5, 2016. May 23, 2016 LHP Jordan Schafer assigned to Oklahoma City Dodgers from Tulsa Drillers. January 20, 2016 LHP Jordan Schafer assigned to Tulsa Drillers. January 9, 2016 Los Angeles Dodgers signed free agent CF Jordan Schafer to a minor league contract. June 18, 2015 Minnesota Twins released CF Jordan Schafer. May 16, 2015 Minnesota Twins placed CF Jordan Schafer on the 15-day disabled list. August 3, 2014 Minnesota Twins claimed CF Jordan Schafer off waivers from Atlanta Braves. August 1, 2014 Atlanta Braves designated LF Jordan Schafer for assignment. August 10, 2013 Atlanta Braves activated LF Jordan Schafer from the 15-day disabled list. August 3, 2013 Atlanta Braves sent CF Jordan Schafer on a rehab assignment to Gwinnett Braves. July 4, 2013 Atlanta Braves placed CF Jordan Schafer on the 15-day disabled list. Right ankle contusion. November 1, 2012 Atlanta Braves claimed CF Jordan Schafer off waivers from Houston Astros. September 1, 2012 Jordan Schafer roster status changed by Houston Astros. August 27, 2012 sent CF Jordan Schafer on a rehab assignment to Oklahoma City RedHawks. August 25, 2012 sent CF Jordan Schafer on a rehab assignment to GCL Astros. August 7, 2012 Houston Astros placed CF Jordan Schafer on the 15-day disabled list. Shoulder. August 22, 2011 Houston Astros activated CF Jordan Schafer from the 15-day disabled list. August 17, 2011 sent CF Jordan Schafer on a rehab assignment to Oklahoma City RedHawks. July 27, 2011 Jordan Schafer roster status changed by Atlanta Braves. May 23, 2011 Atlanta Braves recalled CF Jordan Schafer from Gwinnett Braves. March 24, 2011 Atlanta Braves optioned Jordan Schafer to Gwinnett Braves. October 13, 2010 Jordan Schafer roster status changed by Atlanta Braves. August 23, 2010 Jordan Schafer roster status changed by Mississippi Braves. August 18, 2010 CF Jordan Schafer assigned to Mississippi Braves. August 3, 2010 Mississippi Braves placed CF Jordan Schafer on the 7-day disabled list. Left hand inflammation. July 23, 2010 CF Jordan Schafer assigned to Mississippi Braves from Gwinnett Braves. May 17, 2010 Atlanta Braves optioned Jordan Schafer to Gwinnett Braves. May 17, 2010 Jordan Schafer roster status changed by Gwinnett Braves. May 15, 2010 Mississippi Braves sent CF Jordan Schafer on a rehab assignment to Gwinnett Braves. May 11, 2010 Jordan Schafer assigned to Mississippi Braves from Rome Braves. May 3, 2010 Jordan Schafer assigned to Rome Braves. April 3, 2010 Jordan Schafer roster status changed by Atlanta Braves. October 9, 2009 Atlanta Braves activated CF Jordan Schafer from the 60-day disabled list. September 5, 2009 Atlanta Braves recalled Jordan Schafer from Gwinnett Braves. July 5, 2009 Jordan Schafer roster status changed by Gwinnett Braves. June 28, 2009 Gwinnett Braves activated CF Jordan Schafer from the 7-day disabled list. June 10, 2009 Gwinnett Braves placed CF Jordan Schafer on the 7-day disabled list. June 2, 2009 Atlanta Braves optioned CF Jordan Schafer to Gwinnett Braves.